The building at 29 Franklin Street in Bangor, pictured Monday. The Bangor City Council has approved granting seven years of tax relief to developers who plan to invest over $1 million to improve a property at 29 Franklin Street. For years, that building was off the city’s tax rolls because it was occupied by Northeast Occupational Exchange, or NOE, a nonprofit social services organization that was tax-exempt. But in December 2017, the building was sold to Abe and Heather Furth, the co-owners of Orono Brewing company who are now — through the contractor Cressey, Butler & Cohen — rehabilitating 29 Franklin Street with the goal of attracting a commercial tenant to its first floor and converting its upper floors to apartments. On Monday night, their efforts were boosted by the City Council, which unanimously approved an agreement that will lessen their tax burden as they complete the work. Over the next seven years, the Furths will receive a 75 percent rebate on any real estate taxes that are owed on increases to the property’s value. If the assessed value of the property grew by $10,000 in one year, for example, they would ultimately only have to pay 25 percent of the real estate taxes on that amount. In exchange, the developers have agreed to sink $1.625 million of private funding and equity into the building over the next year. They have said that the project is not economically feasible without the city’s assistance. They’ve already removed a deteriorating glass atrium that once was on the front of the property’s ground floor. A dumpster and temporary metal fencing were sitting outside the building this week. On Monday night, councilors approved the agreement with no discussion. Built in 1912, the three-story building at 29 Franklin Street has an assessed value of $547,500, according to city records. The Furths began renovating the structure after NOE moved out last fall. 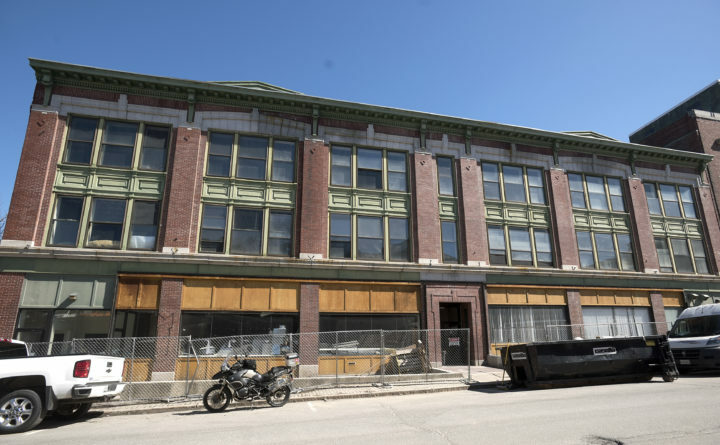 They have renovated two other downtown Bangor properties, 91 Main St. and 26 State St. Heather Furth didn’t immediately respond to a phone call before the council meeting on Monday night. Last summer, the building became part of Bangor’s Great Fire of 1911 Historic District, meaning it was one of the first structures to go up after the devastating blaze swept through downtown that year.